I have been a bit obsessed with sticky wall activities ever since my friend Allie over at No Time for Flashcards introduced me to the idea. Her most recent activity is this cool Valentine's Day Rainbow Wall that we will be trying out soon. Sticky wall activities are created using simple materials and contact paper. For this activity I taped the non-sticky side of our contact paper to a piece of foam board so that the sticky side faced outward and we could move the foam board around the house with us. Once the sticky wall was ready, we could start learning! First we punched out several cardstock circles using our circular punch. You can also cut your paper into any shape for this activity. My 4 year old was my punching helper. Next we wrote all of the alphabet letters (upper and lowercase) on the circles with markers. 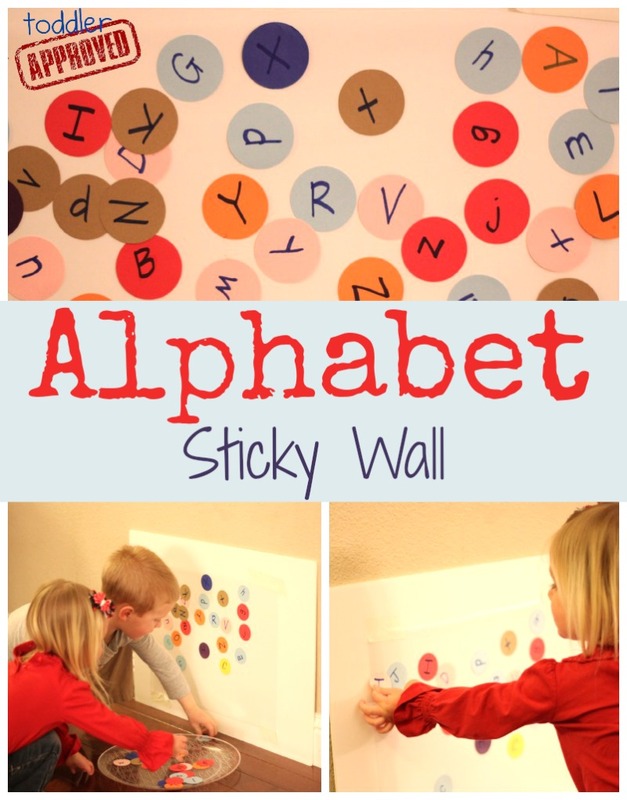 Then I placed the alphabet circles in front of our sticky wall and encouraged my toddler to start sticking the colorful circles onto the wall! My 4 year old son did not want to get left out, so he told the toddler the names of the letters and they worked together to create an alphabet sticky wall masterpiece. My goal for this activity was to begin introducing the alphabet letter names and sounds to my toddler daughter in a simple and exploratory way while having fun together! As she stuck letters on the wall I would say, "cool, you stuck a ___ on the wall" or "look you put a red ____ next to a blue ____." I just made observations about the alphabet letters while she created. Sometimes she would repeat the letter that I said while she stuck it onto the wall. Once my toddler lost interest in the activity, my son had fun rearranging the letters so that the upper and lowercase letters matched one another and were next to one another. I love how you can move the cardstock pieces around and reuse sticky wall activity materials again and again. This activity can be fun for so many ages. You could also write sight words or word family words instead of alphabet letters to make it harder. Do you ever create sticky walls? How do you use them for learning? We love contact paper and use it for all sorts of things. Never to learn the alphabet though. Fun idea. Pinning now! Love this! 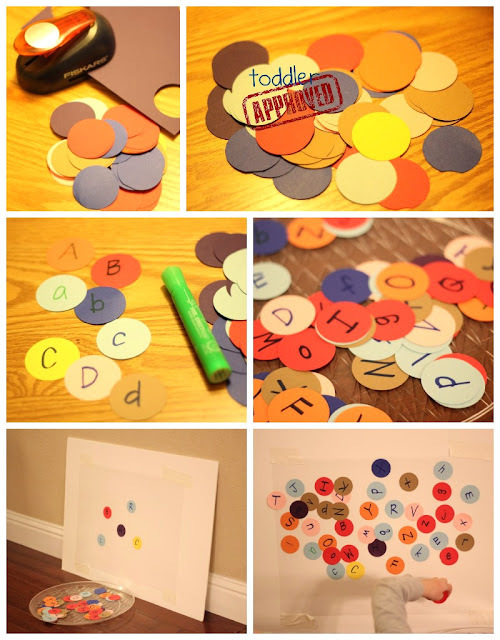 Sticky and letters -- absolutely genius! Can you tell me how many inches was your circle cutter? How many inches was the circle cutter? I have been working with my daughter to help her recognize the alphabets but she doesn't show much interest. She is 2 years 3 months..will try this activity..she might enjoy it. This is extremely amazing and wonderful! Thank you for sharing this. Awesome and perfect for the kids. We also did a Contact Paper Transfer Art out of the same materials you used. You should check this out! I haven't made a sticky wall! What a great idea. You could use this for anything for learning. Wonderful!! I've never made a sticky wall before, what makes it sticky ?? I would really love to do to this w/ my 3 yr old !!! Anoymous - the contact paper (facing sticky side out) makes it sticky. Contact paper aka shelf liner paper.